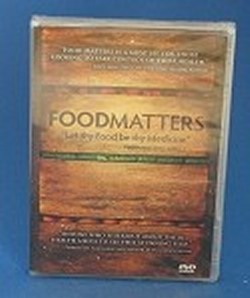 Food Matters - This new documentary (2012) sets about uncovering the trillion dollar worldwide "Sickness Industry" and exposes a growing body of scientific evidence proving that nutritional therapy can be more effective, more economical, less harmful and less invasive than most conventional medical treatments. Find out what works, what doesn't and what is killing you. Worried about health care? By watching this documentary you can become informed about the choices you have for you and your family's health. Most certainly you will discover things you did not know about health, medicine and preventative care. This film is free for orders over $250 but you can buy it or extra copies at a substantial discount here.